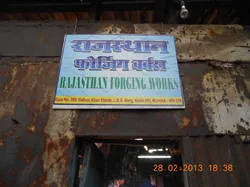 Since 1970, we, Rajasthan Forging Works, are engaged in Manufacturing and Exporting a wide range of Mild Steel Chains, Stainless Steel Pump Chain, Oblong Links, SS 304 Wire Rope Thimble, Extension Links, SS Bottle Screw, Stainless Steel U -Bolt, Steel Shackles, PP Rope Thimbles etc. Manufactured using high-grade raw material, these products are known for their durability, strong construction, corrosion resistant and accurate dimensions. Owing to all these features, the products offered by us are widely demanded in textile, automobile, engineering and oil industries, across the country. Clients can avail these products in various sizes and shapes as per their sizes at market leading rates. We have appointed a team of highly skilled professionals, which helps us in offering the products as per the requirements of customers. Moreover, in order to attain the utmost satisfaction of the customers, we offer these products and services at cost-effective rates. We also accept payment from various simple modes like cash, DD and cheque for the convenience of clients. 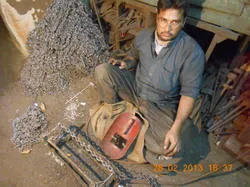 Our organization is supported by a team of skilled professionals, which helps us in offering quality assured range of products to our customers. Owing to their dedication and hard work, we have been able to offer the products as per variegated choices of the customers. Moreover, these professionals work in close coordination among each other to complete all the assigned tasks within the stipulated period of time. Further, regular training is also provided by us to our team members in order to enhance their skills and make them aware of the advance developments. 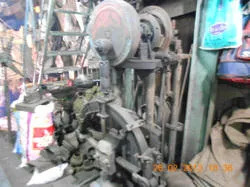 We are engaged in providing closed die, upset, drop, press and hammer forging services to our customers. "Short run" quantities of unique items are produced by us for meeting production as well as service related needs of our customers. Our team members strive to render reliable services for the inevitable "RUSH" jobs that arise. Different types of J.I.T. programs in place, including stocking programs of both raw material and finished parts are offered by us for customers, demanding bulk quantities with uniform production schedules. Raw material for special alloy, non ferrous and ferrous forgings, finished parts and tooling are also stored by us for some of our customers at no cost. We are able to provide different shapes to metals.